You can change the domain name associated with your Website Builder account. You cannot change the domain name for a free Website Builder account. Note: You cannot directly change a domain that has a SSL certificate. Instead, the SSL certificate will need to be rekeyed. From the Settings tab, click Domain Settings. Note: If you see the Publish button in the upper right, click the three-bar icon next to it and select Exit Designer to get back to where you can see the Settings tab. Select a domain of mine if you want to use a domain registered in this account. Type a domain registered elsewhere if you want to use a domain name not registered in this account. 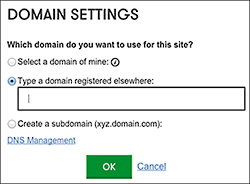 Create a subdomain if you want to use a subdomain of a domain name in your account, e.g. subdomain.coolexample.com. Note: If you chose Type a domain registered elsewhere, you'll also need to contact the company acting as the registrar for that "external" (non-GoDaddy) domain.